Happily Married for 25 years. Daughter of the King. Momma of two. Owned by a Golden Retriever. Seasoned Homeschool Advocate, Liberty University Mom, DoTERRA Essential Oil Representative, Logistical Organizer, Long Distance Move Expert and People Feeder. There is one who covets greedily all day long, but the righteous gives and keeps on giving. Have you ever worked with a person that had to be told to do a complete task and not half of a task? I'm sure many people can identify with working with someone who does the bare minimum. It is such a pain when a co worker always empties the coffeepot and baked goods and never offers to start a new pot or contribute to the kitchen. As a Christian, how do you handle this? Do you say something at the right time and place or do you continue to repeatedly give fully knowing your generosity is unlikely to be reciprocated. Sometimes our family members can be guilty of sapping the life out of us too. Good relationships are a two way street . Give and take with a equal balance is delightful...but it rarely works that way. In different seasons of our lives our amount of giving and receiving probably fluctuate a lot. Where us your heart today? As the season of "giving" approaches, are you fixated on what you'll get or are you pondering the perfect gift for each person on your list? In your relationships, are you sapping the life out of your family members unintentionally or are you a willing contributor to healthy relationships with your loved ones? The bible is very clear about how we, as Christians should live. The verse above says as Christians, we should give without any regard of the possibility of receiving. It can be exhausting, however the message of Jesus will shine through you like nothing on this earth could ever do. There was a time in my life when my plate was very full. My husband had a serious and potentially life threatening illness and was in the ICU in the hospital. At the time we had two children under the age of five and we lived 700 miles from family. My loving sister left her busy family and came the long distance to my rescue! She stayed a long time while I sat at my husband's bedside and prayed for his healing. Dozens of friends prepared meals and helped our family. Clearly, they were serving the Lord without any thoughts of receiving anything in return. My husband thankfully made a complete recovery and over the next several months, our lives slowly returned to normal. So many people left a mark on our hearts with their selfless giving. Both my husband and I consider that trying time in our lives as a defining moment in our walk with the Lord. We chose Jesus and to walk with Him daily in our lives! Lord, open our eyes and our hearts to selflessly give of ourselves to those around us daily. Help us be intentional in our giving to each other with our love and time for Your glory. Amen. While visiting a doctor recently, a friend of mine was not understanding the important information being given to her about her health condition. After a while, the doctor noticed her perplexed look and asked if she understood what he was saying. After thinking for a moment, she quickly asked if he could repeat what he was saying. He asked her why. She informed him that he spoke much faster than she could think about what he was saying! The bible has much to say about our tongue and our use of it. The verse in James gives us very good directions for the way in which we should interact in our relationships. In New England, where we live, a majority of people are flippant and cross to strangers. You just have to wonder if they act that way towards their families? Witnessing this type of behavior is a great prompt to discuss what was seen with our kids. Pointing out how unacceptable it is to treat another human with such disregard is not only a bad witness for Christ, but a horrible habit to have. Our reaction to things being said to us tells a lot about our heart. So many variables contribute to our mindset on a daily basis: fatigue, hunger, stress, pressure, sadness, bitterness are just a few. How we react may or may not make an impression on a life. My prayer is that when we encounter unfamiliar territory we will be able to quietly listen while silently praying to be mightily used by the Lord for His glory and none of our own. In our house, disagreements and lively debates are filled with one common phrase: "Let me finish...don't interrupt me!!!" Everyone wants their voice to be heard. Everyone feels their reasoning needs to be heard. In the Bible, the book of Proverbs 18 is full of wise words about listening to each other. and against all sound judgment starts quarrels. In other words, an unfriendly fool has to have their voice heard and will not listen to anyone or anything else. It goes on to say that fools dig themselves into more and more problems when they don't stop talking long enough to listen. This is one of my favorite verses in the bible! No matter where we find ourselves in life we can run to our Lord and be saved from every calamity we find ourselves in! This encourages me so much and I need reminded of this often. for the ears of the wise seek it out. This means that if we are learning to be wise, we will learn to the important skill of listening to each other. 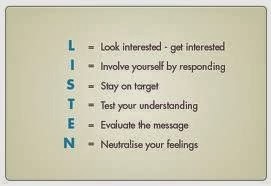 Whether it be about a topic that we want to hear about or not, whether it be difficult or easy to hear ~ listen. Stop in your tracks, open your mind. Be wise. Listen. Everyone occasionally says things they don't mean, but often we need reminded that our words have power. I can remember words said to me many years ago that still today sting in my heart. Of course I have forgiven the person saying the harmful words, but it is just an example of how a moment of irrational conversation can cause a person to never forget what has been said to them. One of the ways we can love each other is to listen to each other without interrupting. It is really really hard sometimes to take the time to hear something that either has been said before or is not comfortable to hear. We can show love by giving our undivided attention to those that we are in a conversation with. Lord, help us to open our hearts and minds to show love in our daily conversations by listening without interrupting. Give us wisdom to know when to be quiet and give us soft words to communicate this love. Amen.